Flanged maces became popular later than knobbed maces. It is likely that they did not appear until much later than knobbed maces but that is not fully certain. There are references to some flanged maces from prior to 1000 AD, in particular in Byzantium. However, it is not certain how accurate this information is. There may therefore have been early flanged maces but if this is the case they certainly did not spread widely until into the 12th century. Flanged maces are generally more difficult to make than knobbed maces. It is possible then that technological limitations held back the spread of the flanged mace head. Flanged mace heads do appear in the east. There are very advanced diamond pattern flanged mace heads from the Kiev region by the 12th century, indeed it is possible that this form, which was to dominate in Western Europe from the later 13th century onwards, originated in Kiev. Flanged mace heads are common throughout the northern Islamic world, in Persian and Turkic dominated areas from the 12th century on. It is possible that the popularity, if not the actual design, of flanged maces spread into Western Europe through contacts forged during the crusades - in particular contacts with the Seljuk Turks. Flanged maces were known in ancient times in the Iranian lands and the design may have survived in these parts through the �dark ages�. 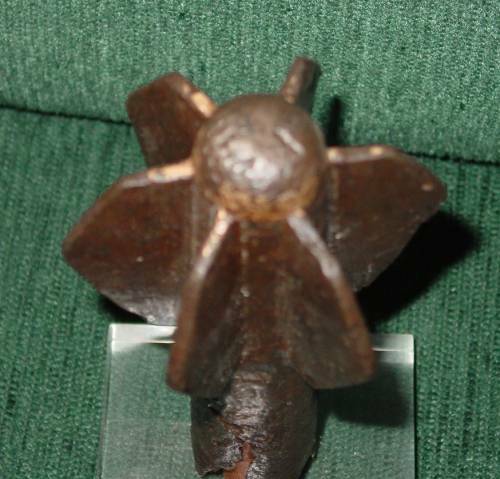 This is an early form of the flanged, or winged, mace head. It was found in Germany or its environs and is likely of local manufacture. The construction is rather crude. It is a relatively light weapon. Spiral flanged maces are shown on two contemporary illustrations - a late 11th/early 12th century carved altar in Campania, Italy and Cathedral mosaics c.1180-1190 in Monreale, Italy. Although in both cases the maces are used by Western Europeans the design probably came from Moslem Sicily. This mace is 6cm in diameter and 5.6cm high. 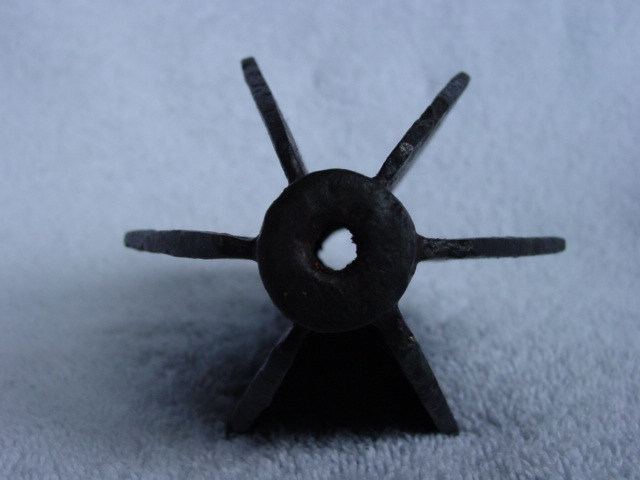 The hole is 2.3cm (bottom) and 2.0cm (top) in diameter. It has 6 small flanges, or wings, set in a spiral pattern. The flanges are 5.0 cm long, up to 2cm high and 4-5mm thick. It is hollow cast and is roughly 3mm thick at the edges. The knobs are solid. It is a relatively light 0.18kg (0.4 lbs). It is made of iron and has seen considerable use. Several flanges are quite damaged. 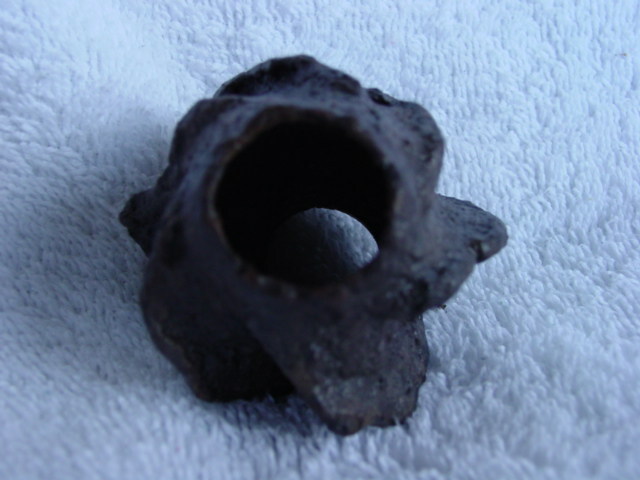 Top view of the same mace head clearly showing the spiral arrangement of the flanges. The damage to one flange in visible on the upper left of the picture. This mace is a small, but classic, design of flanged mace. 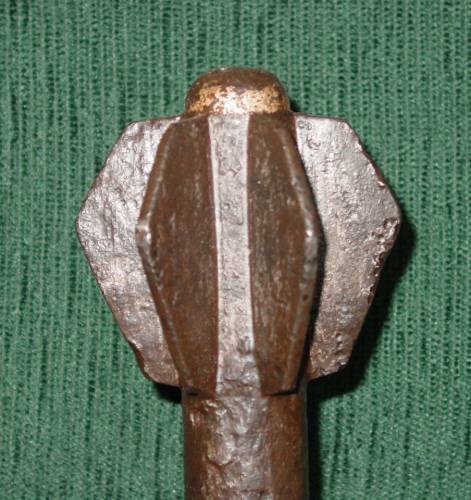 Mace heads of very similar size and shape, in iron or bronze, were in use by the Seljuk Turks in Asia Minor in the 13th century. Given that the Seljuks had �recently� passed through the Luristan/Transoxiana and similar maces had been used in that region in antiquity there is a good chance the the design originated there. This form of mace was popular in the Balkans, where it was known as a Shestoper, in the 14th and 15th century. This example was found in the Balkans. 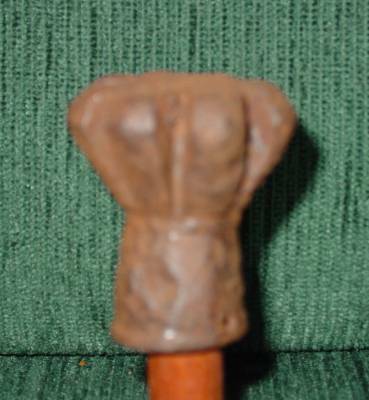 This mace is 5.5cm in diameter and 8.1cm high. The hole is 2.0cm in diameter while the exterior diameter of the neck is 2.65cm. The mace is capped on the top. 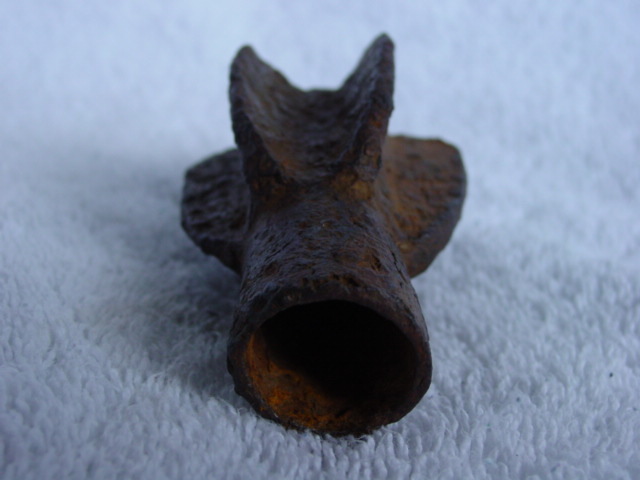 It has 6 flanges, or wings, which appear to be comprised of one forged piece which is attached to a round iron neck. The neck is hollow and is not broken at the bottom. It appears to be complete and was mounted on the end of a long wooden haft. The flanges are 5.0 cm long, up to 1.6cm high and 5-6.5mm thick (tapering to 2-3mm). It is 0.24kg (0.53 lbs). It is made of iron. 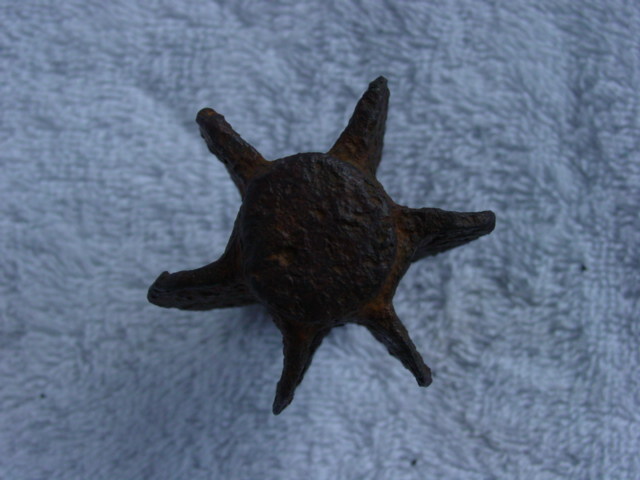 Top view of the same mace head clearly showing the arrangement of the six thin flanges and the solid top cap. 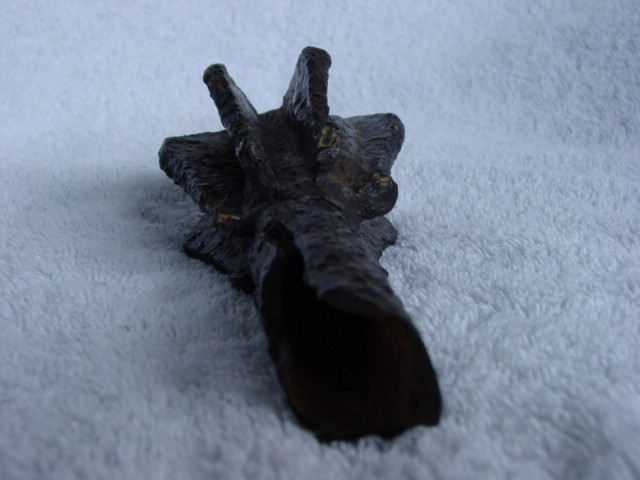 Bottom view of the same mace showing the hollow metal neck. Note how the flanges are wider at the bottom and narrow towards the top. 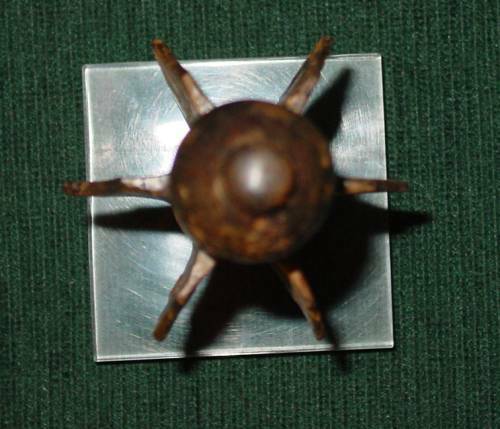 This mace is similar to the mace head shown above. Both have a �U-shaped� profile. However, the flanges are much thicker and more closely set in this example. The flange thickness and placement are very similar to that of 15th to 17th century Ottoman mace heads - which usually have a round or piriform profile. Found in the Balkans this mace was erroneously labelled a Roman mace - which it certainly is not. There is no evidence or record whatsoever of any mace used by the Romans. 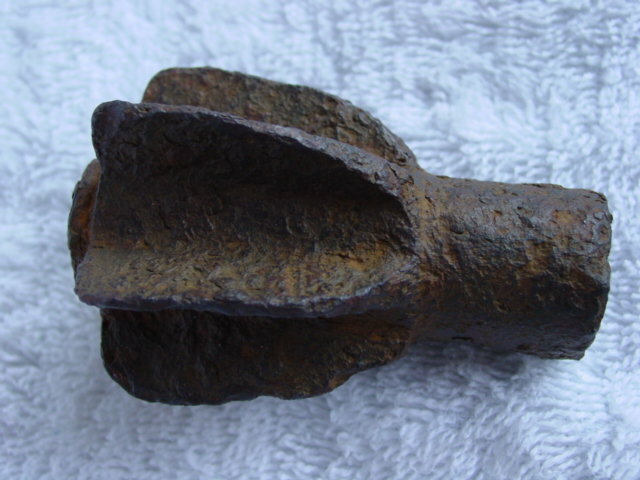 The general shape (like the 12th-14th century Turkic maces) and the flange placement (like the later Ottoman maces) clearly indicates a late medieval date. The mace shaft has a hole for a fastening pin and a slightly flared rim at the bottom. There is also a simple line decorated the top just below the head. Sorry for the blurry images. The 8 thick flanges can clearly be seen in this view. The construction of this mace is rather crude, the flanges are no all even. The mace is 5.4 cm in diameter and 6.0 cm high. The eight flanges are 2.9 cm long, 1.5 cm high and 1.1 to 1.3 cm thick. The lower shaft is 2.6 cm in diameter flaring to 3.1 cm at the bottom. The haft hole is 2.3 cm in diameter. The mace head weighs 0.26 kg (0.57 lbs) quite heavy for its small size. It is made of iron. This is an excellent, and very rare, example of the classic early Western European flanged mace with six flanges and a diamond-shaped cross-section. This mace was found near Ely, Cambridgeshire, in England and is very similar to the famous 13th century Thames mace in the London City Museum. Similar maces, dated to the 13th century, have also been found in Russia. This mace is quite heavy and has very thick flanges. It would be capable of inflicting crushing blows on helmets as well as causing serious damage through the mostly mail armour of the time. This large mace is 6.0 to 7.5cm wide with a head 8.7cm high. It is 16.5 cm tall overall. The haft hole is 2.5cm. The neck is 4.5mm thick. The mace is missing its cap or finial at the top. It has 6 flanges, or wings, which are forged to a single piece of metal which has been wrapped around the iron neck and copper braised to it. The neck is hollow and is broken at the bottom. It was mounted on the end of a long wooden haft. There are still remnants of the haft inside the neck. The flanges are 8.6 cm long, 2.5cm high and 6.5-8mm thick (tapering to 4.5-6mm). It is 0.55kg (1.2 lbs). It is made of iron. In addition to the neck being broken off at the bottom, the head is slightly deformed. This may be due to battle damage or post-burial pressure but is more likely due to a construction flaw. It appears (see image below) that the metal plate to which the six flanges are attached could not wrap fully around the iron neck. There is a 2.5-4mm separation where this seam does not meet. Closer view of head of same mace showing the very thick flanges. Note the small protrusions at the bottom of the flanges. They have been knocked off some flanges but are visible on two. 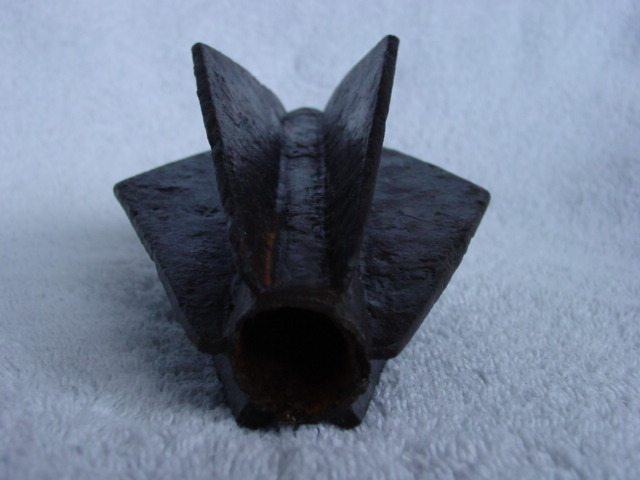 Bottom view of same mace showing the flange arrangement, flange thickness and the break and crack in the iron neck. 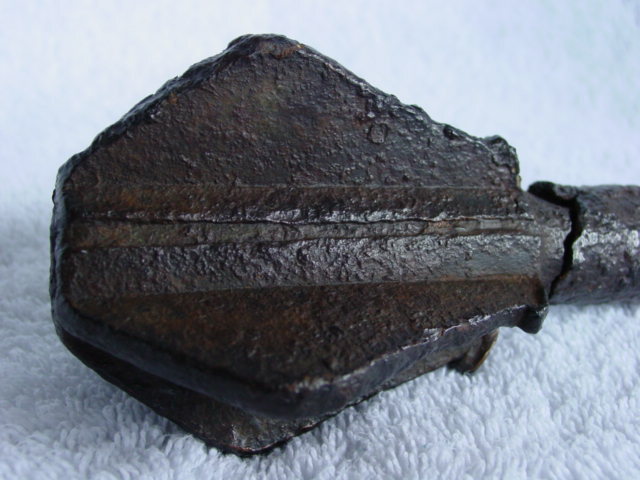 View of other side of the same mace showing the �seam� where the thin plate which the flanges are welded to does not fully meet as it wraps around the neck. This plate was copper braised to the iron neck. 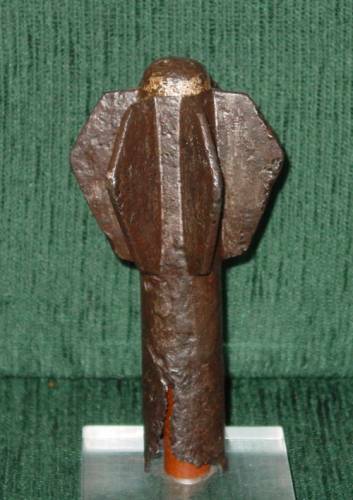 This mace is similar to the English mace shown above although the head is smaller. It was said to be found in Hungary and the squatter shape of the head betrays its Eastern origins. It looks very similar to Kievan flanged maces of the 13th century. The rounded finial is still intact. 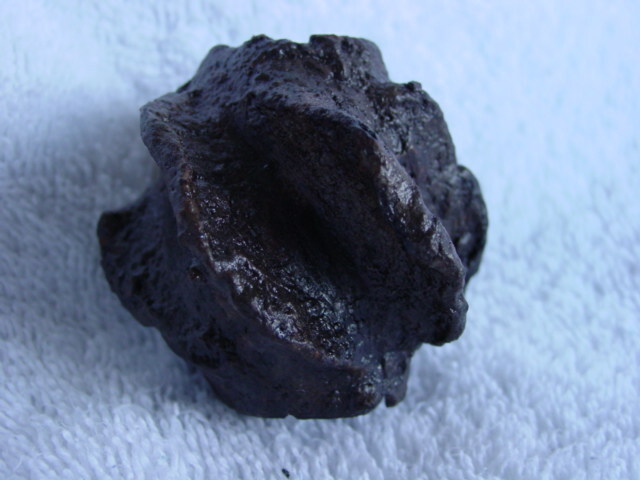 There are still the remains of thick silver amalgam plating on the finial and top edges of the flanges. There has been some damage to the bottom of the haft, although a bottom rim is visible so it is unlikely that much length is missing. The mace is 15.8 cm high and 7.7 cm wide. The six flanges are 6.4 cm long, 2.4 cm tall and 4 to 5.5 mm thick. The shaft is 3.0 cm in diameter and the haft hole is 2.5 cm in diameter. The shaft body is 2 to 3 mm thick. The mace is very heavy at 0.67 kg (1.57 lbs). It is made of iron (steel?). This large cast bronze flanged mace head has the same classic diamond form as the previous maces. It was found in Hungary but is of a clearly European style (i.e. there is little or no Kievan, steppe or Turkic influence). This mace is similar in form and size to the heads of the all-metal �Gothic maces� of the late 14th and 15th centuries. This large mace is 9.8cm wide and 15.0 cm tall. The hole is 1.9cm in diameter at the bottom and the short neck is 3-4mm thick. 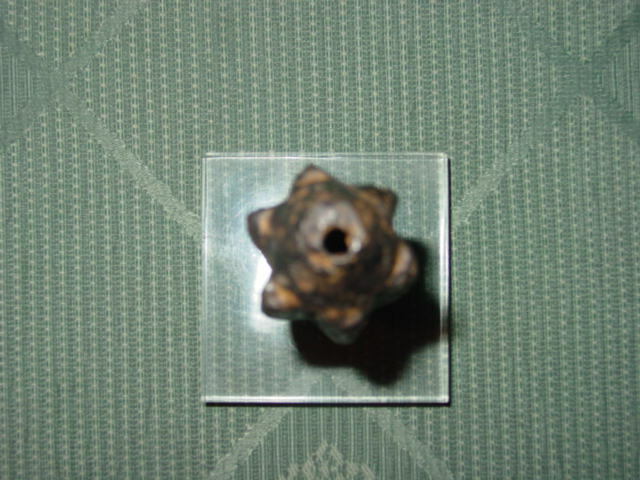 The top end is cast with a partial cover which has a 0.67cm diameter hole in it. 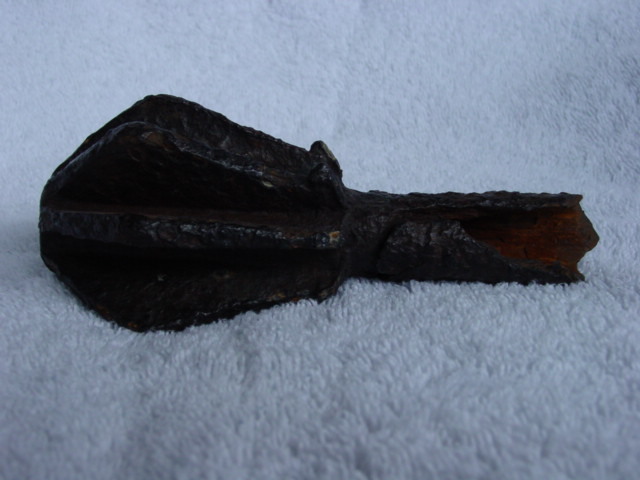 This might have been for a separate top spike driven into the wooden haft. It has 6 thin flanges, or wings. The flanges are 13.7 cm long, 3.7cm high and 3.5-4mm thick. It is 0.66kg (1.45 lbs) and would have been a heavy, fearsome weapon when mounted on a wooden haft. 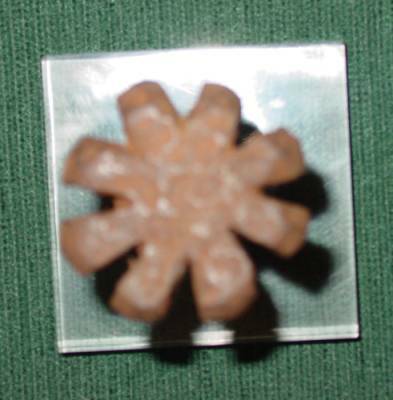 It is made of bronze (although the underlying central neck may be iron). 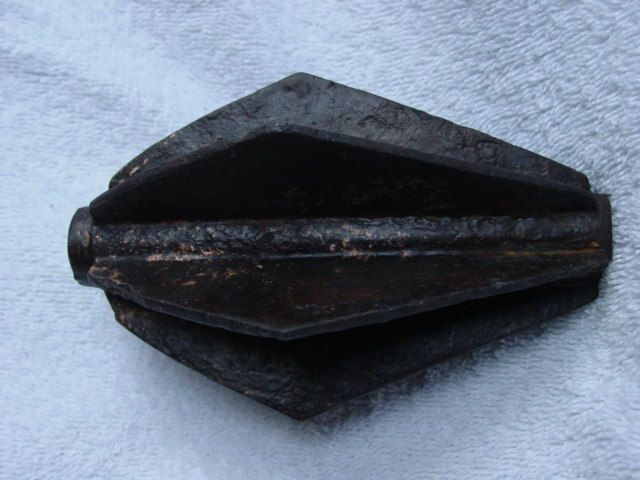 Top view of same mace showing arrangement of the narrow flanges and the partially enclosed top with narrow hole - possibly for a top spike. Bottom view of same mace showing the relatively thin construction of all components. A very interesting mace design. This mace has six, relatively thin, flanges mounted mid-way up a cylinder. The cylinder, including finial is on piece, an impressive metallurgical feat. The flanges are attached to a metal sheet which is wrapped (and copper braised ?) around the cylinder. The flanges have and early gothic style curve to them - a style first seen in Italy in the mid-14th century. 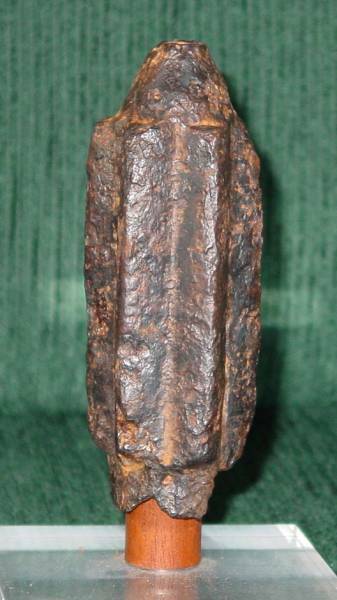 Byzantine maces are sometimes described as elongated and yet flanged so it is possible, especially given the documented Bulgaria find, that this is a medieval Byzantine mace head. While it could also be from some Turkic/steppe influence, the gothic-style flange shape and the high quality of construction indicate a major centre under at least some Western European (or Italian ?) influence. The thin flanges and round finial are clear in this top image. The mace is 19.5 cm long. The flanged part is 6.7 cm long and 7.4 cm wide. The six flanges themselves are 6.4 cm long, 2.3 cm high and 5 mm wide at the base tapering to 2.7 mm wide at the �points�. The haft is 6.4 cm in diameter and 2mm thick. The haft hole is 6 cm in diameter allowing for an impressive haft. It weighs 0.5 kg (1.1 lbs). Not a true flanged mace head, the elongated mace head family are dealt with here as they are closer to flanged than knobbed maces. Elongated, roughly cylindrical mace heads were common throughout the Islamic world. In Arabic they are known as cucumber maces, �khyara-t al-dabbus�. The earliest examples date from the 10th century and they were common in the 11th-13th centuries. The earliest elongated maces were round or six-faceted (hexagonal) in cross-section. During the 12th-13th centuries elongated maces with ridges or proto-flanges appeared although hexagonal ones remained in use. 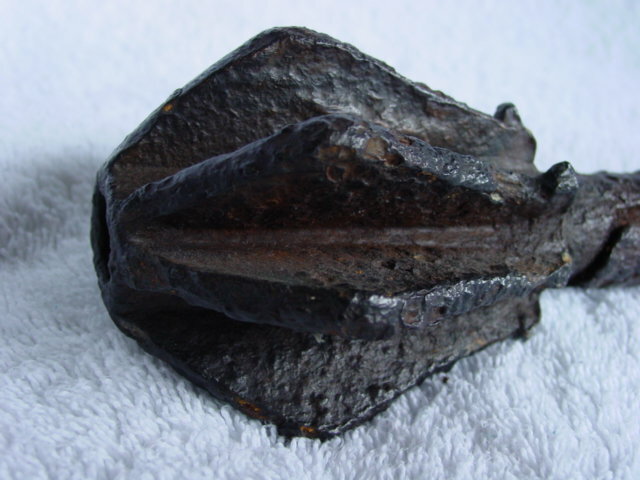 This is a typical example of a 12th-13th century elongated, or cucumber, mace with ridges. There are six ridges, a round shaft extension at the bottom (slightly damaged) and a conical finial portion with a small hole in the top. In this top view the six triangular ridges and the top hole can be seen. The mace is 10.6 cm tall and 4.0 cm in diameter. The ridges or proto-flanges are 7.6 cm long, 1.25 cm wide at the base and 0.9 cm tall. The haft hole is 2.4 cm in diameter. It weighs 0.29 kg (0.64 lbs). It is made of iron and some dirt remains in the haft hole.